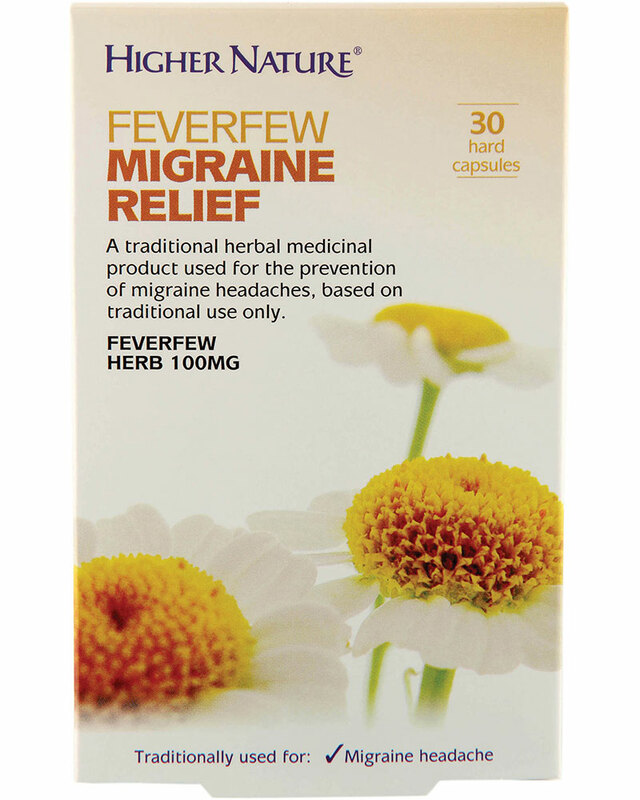 Higher Nature Feverfew Migraine Relief - traditional herbal medicinal product used for the prevention of migraine headaches, exclusively based upon long-standing use as a traditional remedy. Feverfew Herbal Migraine Relief is a traditional herbal medicinal product used for the prevention of migraine headaches, exclusively based upon long-standing use as a traditional remedy. 100mg Feverfew (Tanacetum parthenium) aerial parts. Higher Nature Feverfew Migraine Relief is made from natural herbs. Independently assessed for quality and safety. Higher Nature Feverfew Migraine Relief is not suitable if under 18 years, pregnant, or breast-feeding. Higher Nature Feverfew Migraine Relief is suitable for Vegans and Vegetarians. Feverfew Migraine Relief is free from: Corn, Soya, Wheat, Gluten and Sugar.